This week several happy campers finished building a “Huck Finn” style wooden raft that they had gleefully worked on for the past three weeks. 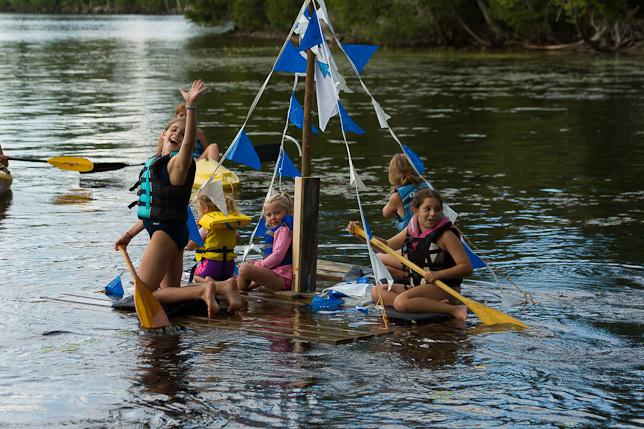 A team of campers, led by co-captains Peaker Jennie and Peaker Cori, worked together with a crew of Sailor Arielle, Sailor Lily and Sailor Gillian to develop the first POP log raft (that we have seen). The craft was made from logs reused from the farm and planks that had been the deck of the dining room. The unique eight foot square raft, an advanced Wilderness Adventure and Discovery (WAD) project was launched and paddled with lots of joy and zest by the campers who were each given a sailor cap and a blue and white scarf for their enthusiastic efforts. They even gave two small passengers a ride.